WETSUITS & SPLASH JACKETS - No Charge! Our highly experienced staff of world-class guides always puts your safety first. 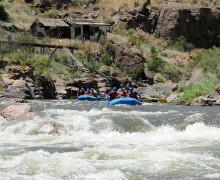 The exciting Royal Gorge is the BEST rafting trip in Colorado. Full day (includes lunch) or ½ day trips available. Family Fun. 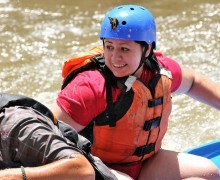 Beginner to moderate level rafting in scenic Bighorn Canyon. Great for kids and adults as well. Perfect for the “Nervous Novice”. 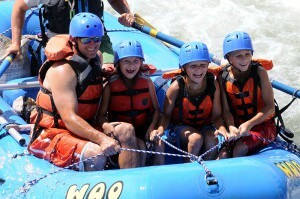 Full Day (includes lunch) - ½ Day and Splash & Dash trips available. 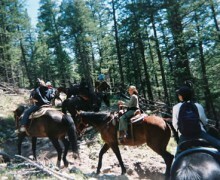 Combine your raft trip with one of several great activities in the area. Options include ½ day rafting in either Bighorn Canyon or the Royal Gorge with Train Ride, Royal Gorge Bridge & Park, Zipline, Trail Ride and more! Click below to see all of our 2018 Special Offers!!! 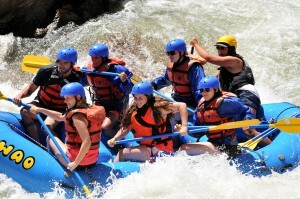 No trip to Colorado is complete without experiencing the thrill of a Colorado whitewater rafting trip. Just as Colorado is famous for world class ski resorts, Colorado is also the go to place for some of the best whitewater rafting in the U.S.. 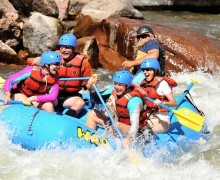 The Arkansas River in Colorado is noted as the most popular place for whitewater rafting trips in the western U.S. At Adventure Outfitters, we have been operating in the Royal Gorge region for over 25 years - same ownership and management the entire time. Our mission is to provide the most memorable and exciting day of your vacation in the Royal Gorge region and nearby Canon City, Colorado. Here you will find some of the most experienced guides in Colorado, great value and easy access to Royal Gorge Rafting or family friendly trips in Bighorn Canyon. 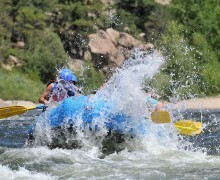 Many of our guides exceed the standards set by the State of Colorado or other rafting outfitters in the area. 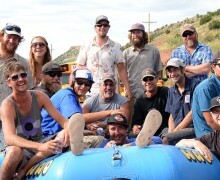 These river professionals can work at any rafting outfitter they choose, yet they choose to work here, at Adventure Outfitters. Our entire staff is dedicated to your safety and comfort level. Our long history and experience level on the river is demonstrated each day, on each trip, as our focus remains on the commitment to excellence and reputation in the industry that is simply second to none. From your first contact with us to the end of your rafting trip, we are confident that we will exceed your expectations and provide the very best in customer service for you, your family or group. 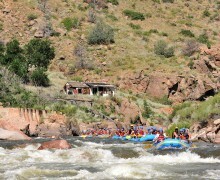 One of the reasons the Arkansas River in Colorado is so popular is that there are many diverse sections which offer anything from a very advanced trip in the Royal Gorge at high flows; this typically occurs early in the season at "high water". 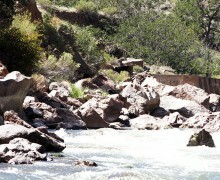 At most water levels during our season the Royal Gorge rafting trip is moderate - intermediate. Also available are very family friendly beginner level trips in Bighorn Sheep Canyon, which accommodates those looking for a trip with the kids on the "nervous novice". 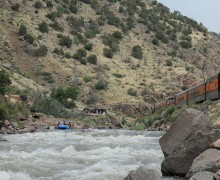 The Arkansas River is also a very accessible place for whitewater rafting, meaning it's easy to get to the access points where trips begin and end, and shuttles are mostly very short. At Adventure Outfitters we offer 1/2 day trips, full day trips (which include a delicious riverside lunch) as well as overnight trips. Check out our "Specials" page for great deals on many of our whitewater rafting trips throughout the season. 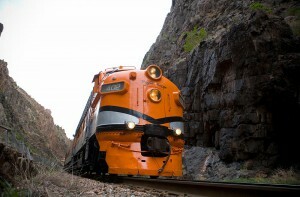 We offer "Combo trips" which include whitewater rafting plus other fun activities such as the Royal Gorge Route train ride, or a Zip-line tour, to mention just a couple of packages. Our area of Colorado is truly a family vacation paradise. Adventure Outfitters is easy to find; we are simply one mile west of Canon City, Colorado on U.S. Highway 50. We are roughly one hour southwest of Colorado Springs, about two hours from Denver. Go to our "Directions" page for details. Don't hesitate to call us at 800.530.8212 with questions, if you need info on lodging, camping or any of the other attractions in the area. 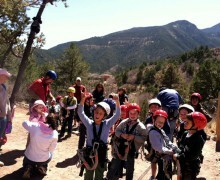 So Start planning today for the adventure you will remember on your Colorado vacation! Thank you so much for such a great trip! 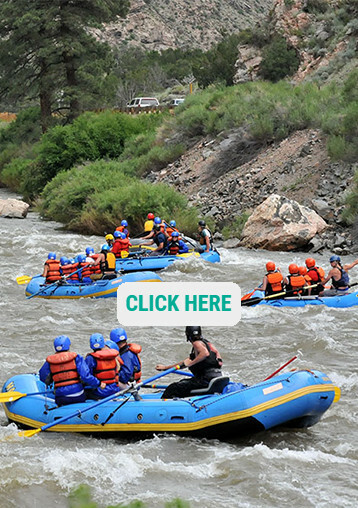 At Whitewater Adventure Outfitters we have been running exceptional white water rafting trips for 20 years in the Royal Gorge region of Colorado one hour from Colorado Springs CO.